I have both everything and nothing to say about my basic tomato sauce. I could write for pages and still have more to say about how it epitomizes everything I love about rustic Italian cooking. It is warm, comforting, and transcends the sum of its most basic parts. At the same time it is beyond simple, the kind of sauce that can be made while the pasta cooks and is so straightforward that a recipe is hardly necessary. 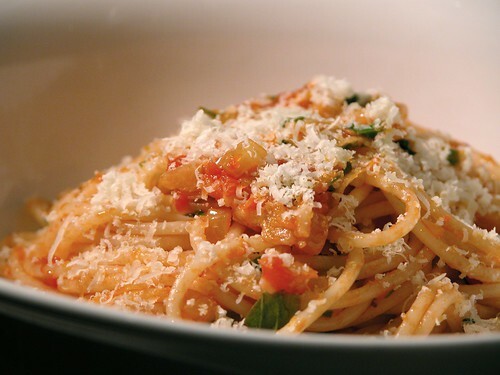 There is really only one thing to remember: Use the best quality canned tomatoes. This doesn't necessarily mean the most expensive, by the way. On the contrary, the brand I buy ("D'oro") are the cheapest I've seen, and even cheaper when I buy them a slab at a time. If you don't already have a brand you're happy with, buy a can each of a few different brands and taste the difference. Tomatoes from Italy are a good place to start but this isn't a guarantee of quality. Mediocre canned tomatoes can be semi-disguised with heat and salt, but the best tomatoes will taste good straight from the can. Not quite 'eat by the spoonful' good (to my taste at least), but slightly sweet and free from any metallic or bitter tastes. This recipe makes enough sauce for one serving of pasta (90g uncooked weight), but scales up very easily to make as much as you need. 1. Gently sauté the onion and garlic in the olive oil with a pinch of salt for 10 minutes over a low heat. They should begin to go translucent, and not colour. 2. Add the tomatoes, and turn the heat up to medium-high. Cook for 2 minutes or until the tomatoes begin to break down and thicken. 3. Add the fresh herbs, cracked pepper to taste, and cook for 1 minute. Although best eaten fresh, at this point the sauce can be refrigerated or frozen. To serve, add the almost al dente pasta and about 1/4 cup of pasta water and toss over heat until the sauce coats the pasta (about 1 minute). Top with grated parmesan and serve.